Last weekend I played Star Wars: Rebellion from Fantasy Flight Games for the first time. 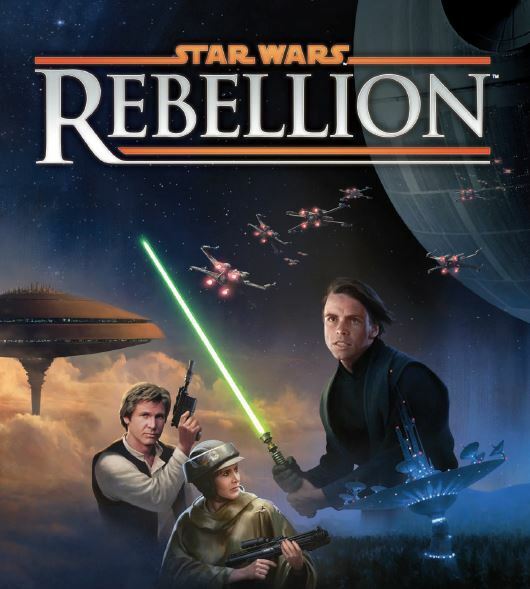 Star Wars: Rebellion is a strategy board game which aims to recreate the Galactic Civil War between the forces of the Galactic Empire and the Rebel Alliance, as portrayed in the original Star Wars trilogy of films. The game is designed with 2 players in mind, though there are rules for team play should 3 or 4 players wish to participate. The game is somewhat asymmetric in nature, as the victory conditions for the Empire and Rebels are very different. The Rebels are trying to achieve objectives which create sympathy and support for the Rebel cause – this can vary from achieving small victories in battle, having influence in various regions of the galaxy or even having systems destroyed by the Death Star. Meanwhile, the Empire simply has to find and destroy the Rebel base, thus destroying the Rebellion once and for all. However, the clock is ticking, and the Empire is in a race against time as the Rebels gain more support to overthrow the Emperor. The game board (which is pretty big) denotes 32 planetary systems, from Coruscant to Hoth, Kashyyyk to Naboo and Mustafar to Tatooine – all names that should be familiar to anyone with a passing knowledge of the Star Wars universe. Many of these systems, if occupied, can supply resources to build and train new forces – whether that be Rebel troopers, X-Wings, AT-STs, TIE Fighters or even Star Destroyers. The game unfolds over a number of turns, during which each player tasks leaders under their control to undertake missions or move forces between systems. As the game progresses, players can recruit extra leaders (thus being able to accomplish more) and build up their forces, depending what planets are under their influence. Each leader has a different combination of skills, and these skills are used to accomplish missions. The Empire controlled Mon Calamari, which is an important planet as it is one of only two systems that will provide a Star Destroyer as a resource. The Rebel player sends Han Solo on a ‘Sabotage‘ Mission. The Imperial player counters this by playing Boba Fett – players roll a number of dice dependent upon character skills, with the player with the most successes (denoted by certain symbols on the dice) being victorious. The Imperial player then plays a ‘Capture Rebel Operative‘ mission using Darth Vader, attempting to capture Han Solo. The Rebel player opposes this with General Madine, but fails, and Han Solo is captured. On the next Imperial turn, the ‘Interrogation Droid‘ mission is played, and though opposed by Jan Dodonna, is successful. However, The Rebel player then counters with ‘Daring Rescue’ using Princess Leia and Han is rescued. Han Solo launches a sneak attack on the Imperial shipyards on Mon Calamari, attempting to sabotage the production of ships for the Imperial Fleet. However, this is attack is thwarted by Boba Fett. Vader then attempts to capture Solo (was it a trap all along?) and succeeds, despite the efforts of General Madine (who was perhaps leading the extraction mission). Han breaks under interrogation and reveals the possible location of the Rebel Base, but is rescued by Leia before the Empire can place a homing beacon on the Millennium Falcon. See what I mean? A great narrative generated from the play of a few mission cards. When opposing Rebel and Imperial forces encounter each other in the same system, combat occurs. This can take place in space, on the planet, or both. Different units generate different types and numbers of attack dice – so Imperial Stormtroopers may be able to kill opposing troops, or even the odd X-Wing, but cannot hope to damage a Mon Calamari Cruiser. Ultimately, the Imperials may well discover the location of the Rebel base, but still have to launch an assault to destroy it (unless they happen to have a Death Star in the area). In our game, the Empire proved to be victorious, destroying the Rebel base on Naboo before the Alliance could escape to fight another day. In short, Star Wars: Rebellion is a great game. The game mechanics are relatively straight forward and easily picked up in the space of a few turns, which means that players can concentrate on strategy rather than constantly wondering about rules questions. That said, the rule books are very well put together, so any rules queries can be resolved pretty quickly. As you would expect from a Fantasy Flight game, the production values on the board, cards and models for the game is top-notch with great artwork and component quality. The combination of battles and missions help to build a story across the length of the game. It adds to the game if both players construct the narrative as the game progresses (see the example above). You don’t have to be a fan of the films to do this, but it helps – I can’t tell you the number of quotes that were flying back and forth during the game! It’s worth saying that this isn’t a short game – I think we were playing for about 3 – 3 1/2 hours – but it is hugely enjoyable, and I am eager to play it again as soon as possible.